Some mornings she could barely make it out of bed. Feeling lonely and depressed, Laianna Baker found it hard to perform everyday tasks, including taking care of her newborn. “How do I start my day? Nobody was there for me. Lots of unresolved issues,” Baker remembers. Shortly after her son’s birth, Baker started therapy at the Mt. Hope Family Center in Rochester. She’s been receiving interpersonal psychotherapy there, learning how to cope, and to look for something that will lift her up. “When I feel low I play with my kid, watch movies—just do things that clear the stress that I have off my mind,” Baker says. Sometimes, she wrestles with Corey on the ground. He loves it. She feels better. Scientific research backs her up. A study published in Development and Psychopathology, conducted jointly by researchers at the University of Rochester Mt. Hope Family Center and the University of Minnesota Institute of Child Development, concluded that mothers who receive interpersonal psychotherapy after showing signs of major depression fare significantly better than the control group, which was merely given community referrals. But the mothers weren’t the only ones to benefit—their children did, too. Not only did the moms become better at parenting—their children improved across a host of important developmental measures. 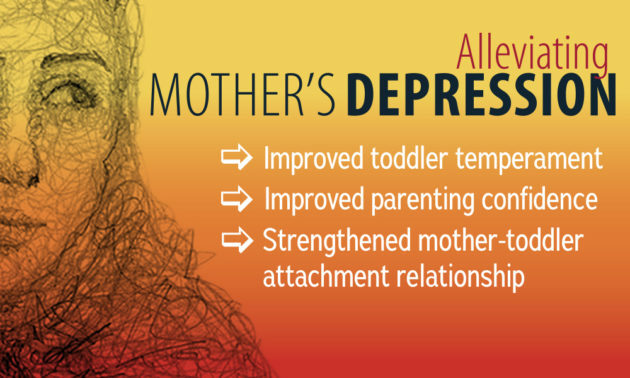 Lessening the mothers’ depression, researchers discovered, meant improved attachment security for their toddlers. Overall, the researchers found that post-treatment the moms in the study became better at reading and understanding their toddler’s temperament, essentially making them better parents, while the toddlers became less fussy and angry, making them easier to parent. “It’s a cascading effect for the family,” says lead researcher Elizabeth Handley, research associate and assistant professor at the Mt. Hope Family Center. Interpersonal psychotherapy is a time-limited therapy that focuses on resolving interpersonal issues and the symptomatic recovery of the patient. The therapy is highly structured and lasts just 12 to 16 weeks. Using a randomized controlled trial of 125 mothers, each paired with her own child, the study looked at reduced maternal depression after psychotherapy and its effect on the children. Study subjects were low-income moms with an average age of 25. The children’s mean age was 13 months at the start of the study. More than half of the mothers, 54.4 percent, were African American. The current research builds on a 2013 Rochester study of moms representing similar demographics, which concluded that screening for depression and providing short-term, relationship-focused therapy can relieve their depression, even in the face of poverty and personal histories of abuse or violence. According to Handley, part of the improvement is a result of shifting the mother’s vantage point. Moms who view their kids as difficult tend to engage in harsher forms of parenting, she says, which down the road can lead to more problematic behavior in the children. Prior research shows that children of depressed mothers are at greater risk for a variety of developmental problems, and establishing a secure attachment relationship with a parent is a critical developmental milestone during the early years of life. Major depressive disorder (MDD) is a significant health concern in the U.S., with 13 to 16 percent of the general populace experiencing an episode during their lifetime. Generally, women are more likely to suffer from depression, with the highest rates occurring among women of childbearing age and during the child-raising years. For economically-disadvantaged mothers the likelihood of depression jumps to one in four moms. Besides finding a way to head off likely problems for the children in later life, there is also a personal component, says Handley, herself a mother of two daughters, ages one and five.